Dogs, cats... we all know that they need help - abandoned and abused, they land in shelters or simply in the street. But guinea pigs? How such small, cute animals can be a nuisance to anybody? And yet even those sweet, furry rodents need help from people of good will. 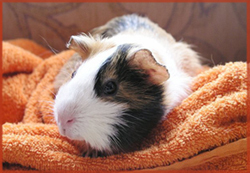 A Club dedicated to Helping Guinea Pigs was founded in the late 2007. A group of cavy lovers was brought together at the "Dogomania" internet forum by the matter of a guinea pig brought to a vet to be euthanized. Gradually the group grew, taking care of other cavies which needed help. Finally we decided to get organized in order to help them more effectively, and an informal society, a Club, was brought into being. WE NEED FOSTER HOMES FOR GUINEA PIGS WAITING FOR ADOPTIONS!!! Come to our reading room for the newest installment of " The story of Bert"!